800 sq. ft. Bottom condo duplex w/ patio - directly across the street with public beach access, and a few walking steps to the ocean. Super cute!! Perfect for couples & small families of 2-4 MAX, including children. MUST BE 25 YEARS OF AGE TO RENT. ** Condo also DOES NOT include TOILETRIES, OR PAPER PRODUCTS. Tenants are responsible for bringing their own toilet paper, paper towels, trash bags, dish soap and laundry detergent. Supplies that are in the unit should be kept stocked and "roll over" to the next guest. • On-site parking for ONE (1) VEHICLE ONLY - HOA enforces towing policy!!! Check-in is @ 3:00pm; check-out is @ 11:00am. Strictly enforced!!! ALL early and late departures MUST be pre-arranged with owner. Fee will apply depending on time. - Master bedroom w/Queen size bed - 22'' flat screen TV. - NEW carpeting installed in the master bedroom - October 2014. - Living room equipped with a 37'' flat screen television. - Expanded basic cable (64 plus channels). - NEW Queen Sleeper in the living room - May 2015. - Full size stove, microwave and fridge, place settings, utensils, and roll-away dishwasher. - NEWER FRIDGE, MICROWAVE, and FLAT TOP STOVE. - Two (2) single sleeper chairs in a den/privacy room. - Full size ironing board. • CREDIT CARDS - Owner accepts credit cards thru HomeAway. - $200.00 refundable security deposit for weekly stays. January 1, 2019 - April 30, 2019 - rents monthly for $925.00 plus security deposit. All utilities are paid for by owner with a $50.00 electric cap. Open parking for 1 vehicle. Roll away dishwasher hooks up to the sink. Minimum Age Limit for Renters: Lease must be signed by an adult at least 25 years of age. Expanded basic cable (64 plus channels), and high-speed, wireless Internet service is also provided. PARKING: 1 car authorized - additional parking off-site. Towing strictly enforced. We had an amazing weekend at Jennifer's place. The process for renting was so simple and she was wonderful to work with during the process. 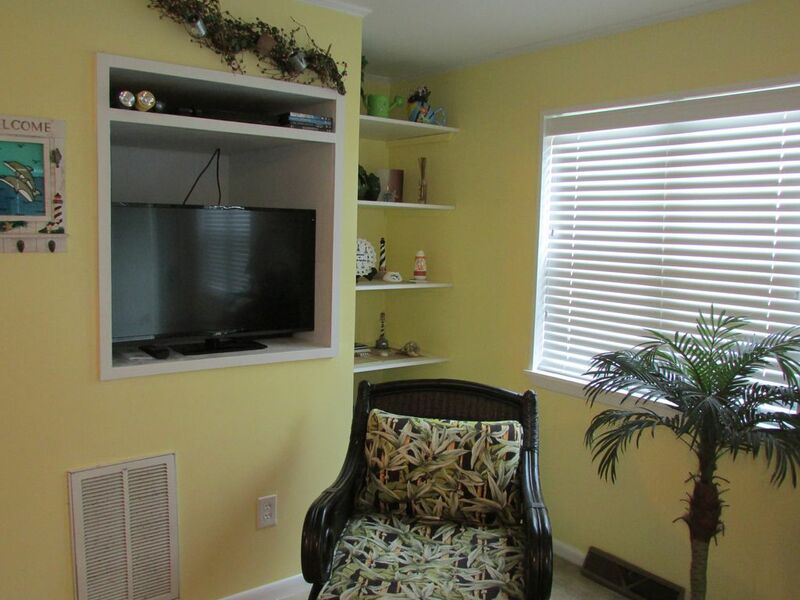 The condo was updated, clean, and very convenient to the beach. It was a weekend we will never forget. We actually got engaged on the beach one evening during our stay!! Thank you for sharing your place with us for a weekend we will never forget! We absolutely loved our stay at Jennifer’s place! It was the perfect place for us to get away for a relaxing, quiet weekend! The place was immaculately clean and neat. We will definitely return! Thank you for being so accommodating and helpful! It was a perfect week...want to schedule time here for next year! The property is awesome! Perfect location...clean and comfortable. Owner, Jennifer....is fabulous and and genuinely interested in making the stay as accommodating as possible. I stayed in Jennifer's condo with my boyfriend and his daughter (6 yrs) and it was perfect for the three of us! The property is well maintained and the unit had everything we could have possibly needed plus more! It was modern and clean. Right across the street from the beach and just a short drive to local attractions and restaurants. The beach was not over crowded and neither was the on site pool. Overall, we had a great stay here and will be returning in the future. It was in great shape and a great location. We will be coming back. Excellent shape, clean and great location. NOTE: The new HomeAway Service fee is a percentage they charge for their services. It is paid directly to them and NOT the owner. PLEASE BE AWARE OF THIS FEE WHEN YOU ARE REQUESTING A QUOTE OR BOOKING. Spring Mar 2, 2019 - Mar 29, 2019 $80.00 $455.00 $915.00 2 nights Easter Mar 30, 2019 - Apr 26, 2019 $85.00 $455.00 $920.00 month 2 nights Pre Summer Apr 27, 2019 - May 10, 2019 $90.00 $525.00 2 nights Summer 1 May 11, 2019 - Jun 7, 2019 $106.00/$125/$136.00 $710.00 2-3 nights HOLIDAYS - 3 night minimum rental. Memorial - Labor Day 2019 - RENTS WEEKLY - min. of 7 nights. SHORTER STAYS WELCOME IF UNIT NOT BOOKED A WEEK PRIOR TO ARRIVAL. NO (1) day rentals. Saturday turnover day for weekly rentals. CHECK-IN IS 3:00 PM; CHECK-OUT IS 11:00 AM. Strictly enforced! All early and late departures MUST BE PRE-APPROVED by owner. A small fee may apply! Tenants responsible for bringing their own linens (queen), bath, and kitchen towels. Tenants also responsible for bringing toilet paper, paper towels, dish and laundry detergent.